Craig A. Concannon, M.D., FACP, graduated from the University of Kansas School of Medicine-Wichita, Kansas in 1984. He then completed his residency in Internal Medicine at University of Kansas Affiliated Hospitals-Wichita, Ks. in 1987. On May 1, 1987, Dr. Concannon joined the staff of Beloit Medical Center, P.A. 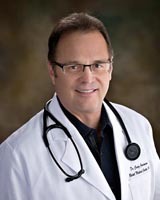 He is board certified by the American Board of Internal Medicine and a Fellow in the American College of Physicians. Dr. Concannon has previously served as President of the Kansas Medical Society (KMS) and remains actively involved with KMS. He currently sits on the Board of Directors of KaMMCO, the Kansas Hospital Association and the Kansas Healthcare Collaborative. He also serves on the governor appointed Kansas Advisory Council on Trauma. Dr. Concannon and his wife, Susan, have three children, Jessica Loveless & husband, Nathan, Kelsy Harris & husband, Larry, twin grandsons, Carter & Burke Harris and son ,Curtis Concannon. 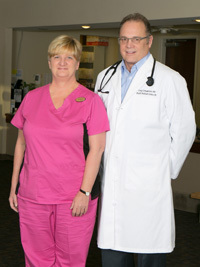 Dr. Concannon and his nurse, Bonnie Cheney. Dr. Concannon is available to see patients at Beloit Medical Center Monday thru Friday, by appointment. If you are experiencing a medical emergency, please dial 911 or your local emergency number for immediate assistance. © 2019 Beloit Medical Center, P.A.